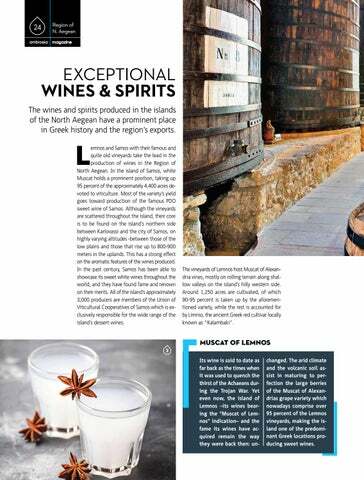 EXCEPTIONAL WINES & SPIRITS The wines and spirits produced in the islands of the North Aegean have a prominent place in Greek history and the region’s exports. emnos and Samos with their famous and quite old vineyards take the lead in the production of wines in the Region of North Aegean. In the island of Samos, white Muscat holds a prominent position, taking up 95 percent of the approximately 4,400 acres devoted to viticulture. Most of the variety’s yield goes toward production of the famous PDO sweet wine of Samos. Although the vineyards are scattered throughout the island, their core is to be found on the island’s northern side between Karlovassi and the city of Samos, on highly varying altitudes -between those of the low plains and those that rise up to 800-900 meters in the uplands. This has a strong effect on the aromatic features of the wines produced. In the past century, Samos has been able to showcase its sweet white wines throughout the world, and they have found fame and renown on their merits. All of the island’s approximately 3,000 producers are members of the Union of Viticultural Cooperatives of Samos which is exclusively responsible for the wide range of the island’s dessert wines. 1 The vineyards of Lemnos host Muscat of Alexandria vines, mostly on rolling terrain along shallow valleys on the island’s hilly western side. Around 1,250 acres are cultivated, of which 90-95 percent is taken up by the aforementioned variety, while the rest is accounted for by Limnio, the ancient Greek red cultivar locally known as “Kalambaki”. changed. The arid climate and the volcanic soil assist in maturing to perfection the large berries of the Muscat of Alexandrias grape variety which nowadays comprise over 95 percent of the Lemnos vineyards, making the island one of the predominant Greek locations producing sweet wines.